There is 50 states. Not 6, 7 or 13. Many states have strong preferences for one of two parties. Vote for the other party is meaningless since you loose anyway. That is only true (voting for the other party) because of "winner take all." If the electoral college votes were apportioned by state to each party instead, then voting for one or the other party makes a huge difference. It also means that the Democrats never win another Presidential election for at least 50 years. Why ? Democrats won all the popular votes since 1992 except for 2004. Without electoral college Rrepublicans will not be able to win presidential elections. Because of population distribution by state. For example, California has 55 electoral college votes. The state reliably has a Democrat majority. In winner take all, the Democrats get 55 votes. In apportioned by vote the breakdown would be closer to 60 - 40. That is, the Democrats get about 33 electoral votes, the Republicans about 22. That is disastrous for the Democrats. All you have to do is look at this map. 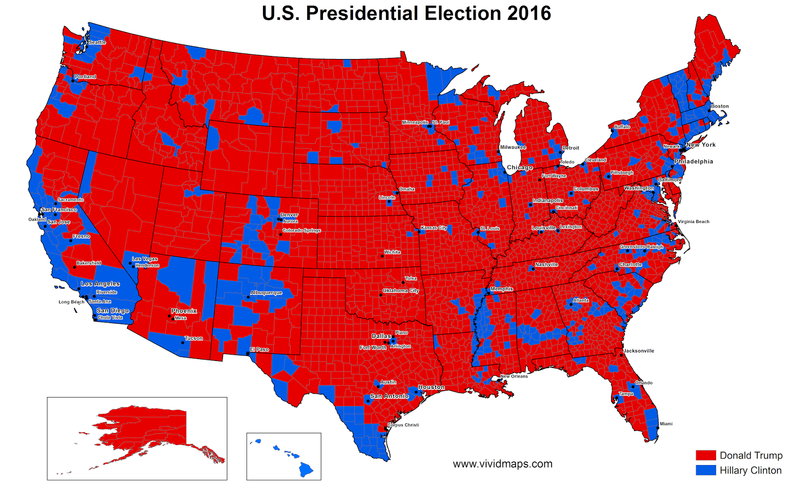 That sea of red means the Democrats lose electoral votes in states they hold majorities in, while the Republicans gain votes because winner take all is by state and most Republican leaning states overwhelm their Democrat opposition. This is why the Democrats want a straight popular vote. They have the numbers in dense urban areas but stand no chance outside these. They know it. That gives their numbers clout against the low population areas the Republicans control. The Republicans would want to eliminate winner take all as it dilutes the Democrat voting strength in urban areas because large parts of those states they are in have significant Republican minorities outside the big cities. It perfectly works the other way around. Florida has 29 electoral college votes. Democrats loss by 1% of popular vote. So it will mean 14 votes for Democrats and 15 for Republicans. North Carolina had a difference of 3% but all 15 votes went to Trump. The popular votes say it all. Hillary won 3 millions more than Trump. The system works against the Democrats since they lose the advantage of numbers. If the system of "winner takes it all" is removed, Democrtas will also win from it. Electoral college is basically another form of gerrymandering. Republicans run for president based on the current law, not one that doesn’t exist. You can’t assume that a massive change in the way presidents are elected would have no effect on that actual vote. The dems did not win the popular vote in 1992. They won with less than a majority of the popular vote because Ross Perot did pretty well for a 3rd party candidate. The system works as intended. The system predates both political parties and recognizes the individual sovereignty of the states. The fact that you believe the EC is a form of gerrymandering tells me you don’t understand its purpose. Last edited by Cambronnne; 13 Jan 19, 16:17. I see no reason why the vote will undergo important changes if the law will be changed. The changes will impact both sides. In 1992 Clinton get more popular votes than both opponents. The system predates predates both political parties and recognizes the individual sovereignty of the states. Why state sovereignty should matter for the election of the federal president ? Wow. The level of ignorance in that statement definitely set a new record. Because the States are sovereign over their own territory. There are 50 individual states. Not 50 parts to the federal government. The system is designed to protect the smaller states from being made irrelevant. Clinton won with a plurality. Not a majority. Yes, the changes will impact both sides. But it will change the way people vote. Trump won because he ran his campaign in a way that was consistent with the existing law. Hillary didn’t. It won;t happen though because such a change requires that 2/3s of the States be willing to make themselves subservient to California and New York. Few States are going to support a Constitutional amendment that tends to weaken their influence. The states cannot be sovereign. If there is a federal government, it automatically means a loss of sovereignty. The system doesn't protect states. Only the states in balance are important, others are not. How can it change the way people vote ? As long as there is two parties, people will vote for one of them. But it can allow to have more parties, which is a danger both for Republicans and Democrats. 2/3 of the states are already subservient. The outcome of the election is decided in a dozen of states. The outcome for the others is known in advance. I already knew that you make completely ignorant posts. I don't see why you want to confirm it.